Author's Note: My digital camera is currently out of commission, so I have used other contributor's images to illustrate this article. I have credited all images where used, and appreciate the effort by each contributor. If any photographer/contributer would prefer that I not use a specific image, please let me know by PM or posting in response to this thread and I will take down the image. Fighting Formations: Grossdeutschland Motorized Infantry Division is a platoon-level tactical war game set in the early to mid Second World War period and focuses on historical unit actions fought by the Grossdeutschland Motorized Infantry Division in  1942 through 1943 . With ten historical scenarios and one learning scenario, the game covers the evolution in weaponry and fighting tactics that sharpened the unit from what was essentially a well-equipped infantry division to a fully-mechanized integrated elite fighting force. 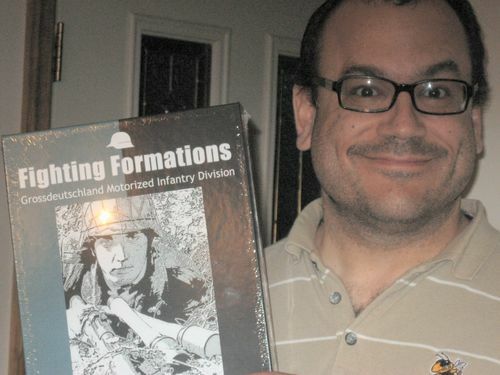 Innovative designer Chad Jensen, still riding high on the successes of his popular Combat Commander franchise and the fan-beloved euro-wargame/hybrid Dominant Species game, has once again applied his keen skills at rules creation to make what I believe is a very solid foundation for another successful series. The game is played on 56cm X 89cm (22"x34") full-colour back-printed mapsheets (four are included in the box), with a two double-sided colour reference cards - 21.6cm x 27.9cm (8.5"x11") and one double-sided colour track card 27.9cm x 43cm (11"x17). The counter mix includes 15.9mm (5/8") counters (most infantry and machine gun units), rectangular 15.9 x 31.8mm (5/8" x 1-1/4") counters (AFVs and guns), 12.7mm (1/2") hit and status/administrative markers, 19mm (3/4") circular command and event counters and 19mm (3/4") hexagonal fortification makers on five die-cut cardboard counter-sheets. 55 cards, 10 dice (two each of d6s, d8s, d10s, d12s and d20s), 10 wooden order cubes, and 1 initiative pawn are included, along with a 24-page series rulebook and a 48-page playbook specific to the module. The maps depicts the varied terrain of the Eastern front, with hexes representing 75m (250') per hex. Time scale is approximately 5 minutes per turn. Playing time varies from about  120-180 minutes for the smaller one-map and half-map scenarios to probably 480-700+ minutes for the largest, two-map monsters. Each unit counter represents a platoon or squad of soldiers, vehicles or guns. 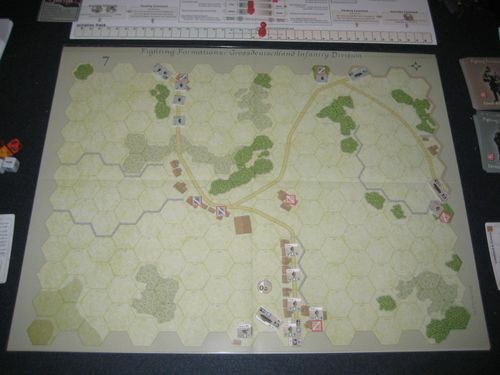 Breaking away from the usual wargame mold, rectangular counters are common, as are circular and hexagonal markers. 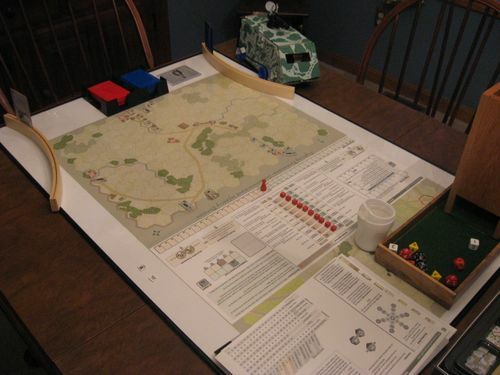 Although some might assume this game would be a scaled-up version of his very popular Combat Commander system, the only thing this game has in common with his previous wargame system is the tightness of the ruleset and the general design outlook of simplicity of play through employing a rigorous "design for effect" approach. Everything that can't be evoked by a mechanic which causes the same thing to happen without a cumbersome list of rules has been surgically excised. ...and yes, it has tanks. Lots of them. The core of the new system is the initiative-based order matrix. Instead of a fixed turn order and sequence of play, players select order cubes from a matrix (pictured above) and adjust the initiative pawn according to the cost of the order. Requesting Divisional Assets, for example, costs 10 initiative. By comparison, a fire order costs 3 initiative for the Soviets (but only 2 for the Germans). In this way, an element of the command structure and general doctrine of opposing forces is "baked" into the design of the order matrix, resulting in an asymmetrical arrangement of the effectiveness of leadership. The player may conduct the order listed beside the cube, or any order lower on the "scale" of orders on the chart. This permits flexibility at the cost of initiative - you can take a battalion order to conduct a simple move order, but the cost is enormous. After the order is paid for, individual units are activated, for 0, 1 or 2 initiative each (a clever modifier in the case of radioless Soviet tanks is that this cost is doubled for Move or Assault orders). A unit costs 0 initiative to activate if it is within command range of a "Mission Command" marker, 1 initiative if it is within command range of a "Tactical Command" marker, and 2 points per unit if they are outside of the command radius of any friendly Command marker ("Out of Command"). 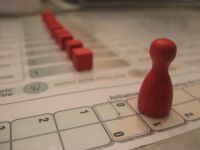 The initiative marker is adjusted to reflect this activation cost, and the player conducts his order. At the conclusion of the order, if the initiative pawn is still on his side of the initiative track, the player may take another cube and carries out the order. If it has landed on the opponent's side of the track, the opponent takes a cube and conducts an order, and so on. This sequence continues until all the cubes are gone, at which point a short end of turn sequence is conducted (which includes a wicked, potentially-crippling Sniper action, used to represent the general breakdown in command and control as a battle progresses), and the order matrix is "re-seeded" by randomly rolling for new orders. If this sounds suspiciously like a Eurogame mechanic, it is. It's a classic worker-placement/drafting mechanism (in reverse) dressed up in a shiny new uniform, and if you're a die-hard wargamer that points and howls like Donald Sutherland's character at the conclusion of "Invasion of the Body Snatchers" when you see Euros, get over it. This is an amazingly simple and effective order-driven system that avoids the clunky C3i systems used previously in games like John Hill's Eastern Front Tank Leader series while simultaneously modelling the subtle differences in command style and doctrine between Soviet and German forces. Combat is quick and simple, but also incorporates a few changes from the "usual". To resolve direct fire, attacking Firepower is added to a roll of paired dice, typically 2d10, but the dice may be increased or decreased in a 2d6 > 2d8 > 2d10 > 2d12 > 2d20 sequence depending on various conditions. If either of the attack dice shows a number equal to or less than the hindrance of any hex being fired through (hindrance is indicated on the terrain effect chart), the attack immediately fails. Interestingly, there is a default hindrance of 1, so anytime a die shows a 1, an attack fails automatically. The resulting attack total is compared to a defenders morale or armour (depending on the AP or HE firepower used), terrain modifier added, plus 2d10. If the result is greater than the defence total, the attack is successful and a randomly drawn hit marker is placed on the target unit. The hit markers have a range of effects from "shaken" to "unconfirmed kill" and vary slightly for infantry and vehicles. This hit marker mechanic has most recently been seen in Conflict of Heroes: Awakening the Bear! 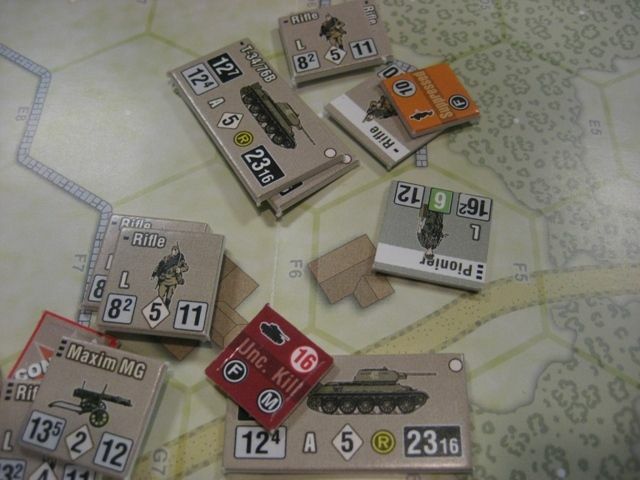 – Russia 1941-42, save that in this game, the result is not secret, a economical design decision which allows infantry and AFV results to be printed on opposite sides of the same hit counter. There are a number of other clever little modifiers and mechanics built into the combat system (pivots, arc-restrictions, etc.) which are best experienced to be understood. A seldom-seen (but not unprecedented) Reaction Fire mechanic is incorporated as well, wherein anytime a unit fires, an opposing unspent unit may fire back on the firing unit (the opposing unit need not be the one just fired upon). If the fire roll is less than or equal to the Rate-Of-Fire (ROF) stat on the counter, the reaction fire unit is marked "spent" and may no longer react for the remainder of the current order. Melee combat, here not necessarily representing direct hand-to-hand fighting but rather close combat within the same 75m hex, is handled by rolling paired dice, the "size" of which is modified upwards or downwards by a method similar to that used in fire combat, but in this case you're trying to beat a number found on a chart comparing the two units involved. This is important, because on initiation of a melee attack, the defender chooses the target unit. This clever twist introduces some interesting wrinkles to a what is typically an straight odds-based fight. The melee chart seems to be slightly less successful in comparison to the relatively simple direct fire system, but it's still not too difficult. One or two chart look-ups for melee actions which are supposed to be pretty "climactic" anyway is a small price to avoid the various special cases and modifiers necessary for combat in other tactical systems. Artillery and air support is handled with the same simplifying (but not simplistic) approach and also contains a few nuggets of fun - for example, in aerial attacks, after the accuracy is checked, the air strike hits the closest occupied hex, which may or may not be occupied by the enemy. Once again, a chart indexing the unit with the relative effectiveness of a strike against that type of target is included, effectively "baking in" a number of factors which might otherwise require complex exceptions (such as artillery fire vs. open-top vehicles). 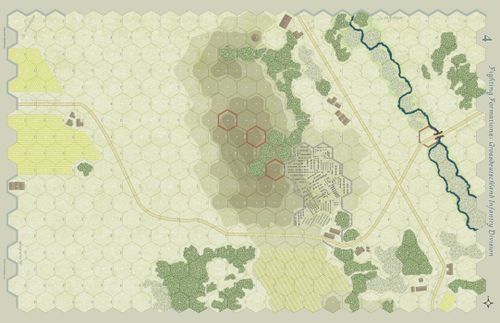 Movement is the typical movement point-based wargame convention, though Jensen has added a twist that AFVs that enter hexes which are difficult to pass through (some forest and town hexes) must be marked "in column", which makes them less effective in melee combat, negates the cover benefit of the hex and adds stacking restriction (1 platoon/3 squads). This effectively removes the motivation to continue time-honoured tradition of hiding tanks in forest/town areas for cover, a wonky convention dating back to one of the grand-daddies of wargaming, PanzerBlitz - "PanzerBushing". Op Fire is conducted in a conventional wargame manner, except that units can op fire for each MP expenditure as long as they are not marked spent by rolling equal to or less than their ROF stat. Rallying is handled by a straight die roll to equal or exceed the target number. Failure is usually harmless, though red-printed rally targets result in the "elimination" of a unit. ...Which leads me to the next little variant in these rules; instead of the usual step-reduction by flipping counters, platoons break down by "elimination" (admittedly, a somewhat misleading term) into two squads, with one squad inheriting the hit marker. This simultaneously models casualty reduction and combat effectiveness reduction, since activation cost is per unit, not per hex. As a result, broken-down individual squads are difficult to control efficiently in relation to whole platoons. This is a great mechanic, but it carries with it one of the few kludgy moments I've run into thus far in the game - if you have a hex with two or more platoons get hit, each one rolls for defence when attacked, and each one can potentially break down into two squads each if "eliminated". Then, units can Reaction Fire (one of the two newly created squads can fire) and then Op Fire may also occur in some situations. This can result in a lot of wristage. I ran into this phenomenon when occupying a critical hex with a tank platoon and two infantry platoons, which I would imagine would not be an uncommon game situation. Ultimately, I ended up with six units in the hex as a result of fire - two tank squads, and four infantry squads, some with hit markers, some without. I was "fighting" with an adjacent hex, which had two infantry platoons, which also eventually broke down into four squads, some with hit markers, some without. Of course, this isn't unique to this system, some fire/melee situations in ASL will generate similarly roll-happy results. I eventually mustered three of the squads back into a platoon after some decent rally rolls, and I suppose the lesson is to not stack platoons in this system, but it felt like a grinding noise in an otherwise smoothly oiled machine. 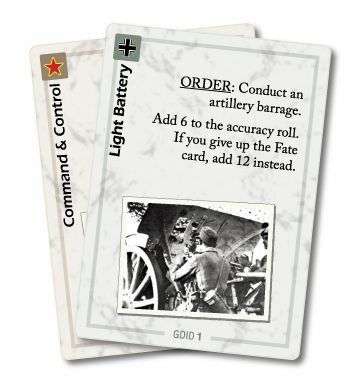 Assets, such as artillery, air strikes, smoke screens and other special combat events are represented by cards, which can be drawn as a result of orders (assets are frequently assigned at the beginning of a scenario as well). Assets are activated by the "Asset" order, but can also be played as a Reaction in the right circumstances. Random Events are added by mutual consent and are an optional rule. Since I haven't played a game involving random events, I'll save comment until I've had experience with them. The artwork and graphic design are good, if generally subdued, an not altogether unwelcome counter to the general trend of gaudy, over-produced games these days. They are certainly functional, with a few extremely minor missteps mentioned below. The physical counter quality is typical for GMT, which is to say, above average. Counters punched easy without delamination, and the die-cutting is clean. My sets were centred correctly with no evidence of problems, though apparently some people have reported minor off-set issues. Another extremely minor nitpick is that the vehicle counters flip along the long axis (side to side) while the infantry counters flip top to bottom and the smoke counters flip top to bottom as well. Although I had no problem with this after some initial cognitive dissonance, my opponent struggled with the (understandable) inconsistency throughout the game. Come on, when you start picking nits this small, you know the game doesn't have any really big problems. The artwork on the counters is, as mentioned above, somewhat understated but very serviceable, clear, readable at a distance and easily understood. A minor nitpick is that on first introduction, it's somewhat difficult to distinguish squads from platoons, although their stats differ and there is a small one pip vs. three pip indicator in the top left, the difference could have afforded to be more marked - ASL and other similar tactical games handle this by varying the number of figures depicted, and in early prototype artwork this method was used. The designer's reasons for abandoning this approach are reasonable, if debatable, as are the conscious decision to use side-views vs. top views for the AFVs. Some people have also commented that due to a slight production issue with colour, the colour for Germans is very close to the colour for the Soviets. I don't see this as being significant, though perhaps my lighting was better suited to highlight the differences. Although the game box art is very clean, graphically speaking, it's also pretty boring. The Photoshop-filtered image of the grenadier is not terribly interesting, in my opinion, and while the back of the box is ...informative, the text and descriptions are so clinically bland as to be off-putting. Certainly it avoids the hyperbole found in some publishers' ad copy, but it makes the game and its gameplay look and sound as exciting as unsalted-top crackers. This is really unfortunate in my opinion, because if I picked up this box in a game store without having read about its development and approach, I would've probably put it down again without a second glance. This box makes this game sound and look utterly non-descript, when it should shout out about what an exciting, novel and well-designed game it is. Oh well, those in the know will get it. The double-printed maps are clean and, once again, subdued, with the same general look as the Combat Commander maps. As far as I can make out, some represent historical terrain, while others are more generic, though I am uncertain on this point. The rulebook is, as has become typical for Chad Jensen, a masterwork of conciseness and clarity. Though the concepts are new and different, I haven't encountered anything which could not be clearly read, understood and cross-referenced in a logical manner. To further cement the clarity, the playbook contains over a dozen pages of step-by-step play examples which show in very close detail steps involved in each of the major order and play steps. The reference sheets are functional and clear, though some information (which eludes me at the time of the writing - I will try to pull out the game again nd remember) might have been positioned better. The million-dollar question... how does it play? The initiative order/matrix introduces a new decision-process above and beyond the typical tactical considerations. Should you maintain tempo and try to do small, precise movements, keeping the initiative on your side, or should you try for the "big move" and wipe your opponent off the map before he can react? Do you take that big Divisional asset cube while you can, but hand the initiative to your opponent as a result, or do you wait until the situation isn't as dire and hope that he does want to take the risk either? The great thing about this system is that because of the simple mechanic of "pick an order, execute an order", the decision-making doesn't become laboured - you can be as impulsive or as control-obsessive as suits your playing style. Then, carrying out the order follows almost intuitively. You don't get the gamey-ness of knowing that you'll have the guaranteed luxury of moving your units out of harm's way only to advance them back during an upcoming phase (*cough* skulking *cough*), though it can be argued that the set costs of activation can also be "gamed". This aids in the tension of not knowing exactly what will come next from your opponent, one of the few things that can't be simulated well when playing this game solo. Combat is resolved quickly, with relatively few modifiers, and the ones that are required are easily remembered. The asset cards cover multiple situations which might otherwise become clunky in play, with a minimum of fuss, but add enough colour that you don't feel like you're playing a "generic" wargame. 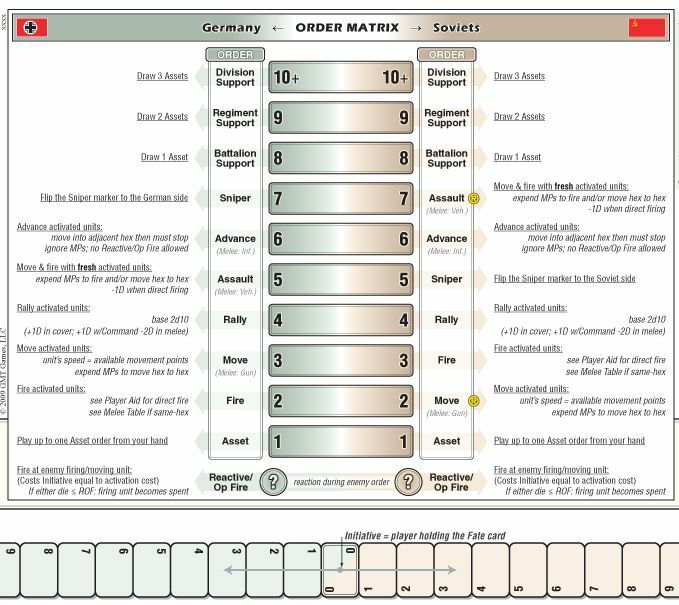 The order mechanic avoids the abstract "APs" and "CAPs" found in the Conflict of Heroes system, and models command and control with the mission and tactical command markers, without needing a complex and potentially game-able HQ system (targeting units with HQs stacked with them being a common result). The decay of Mission to Tactical command models a sort of order delay in responding to local threats and tactical successes or failures, something which requires an entire subset of rules in the Tactical Combat Series (TCS) - albeit the FF:GD system does not cover that aspect in quite as much depth. You get a real sense of both the tactical, battlefield decisions and the command-level, asset and operational management decisions, which hits just the right notes for a wargame at this level. 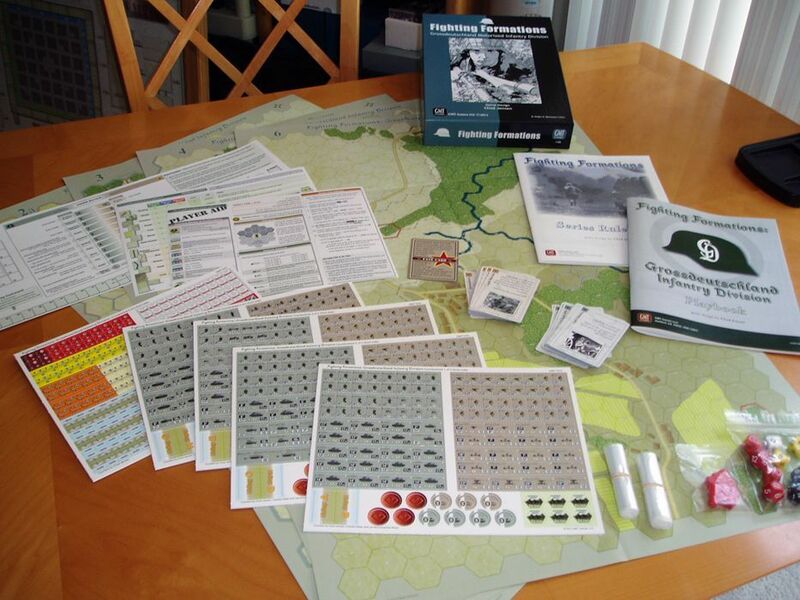 It plays faster than the Panzer Grenadier system, feels more "real" (whatever that means) than the Nations at War system, the ruleset is far cleaner than PanzerBlitz: Hill of Death – The Battle for Hill 112, Normandy 1944 and avoids getting bogged down in card trumping decisions as in the Tank Leader system. It's on a different scale than the Lock 'n Load, Advanced Squad Leader, Conflict of Heroes or Advanced Tobruk systems, so direct comparisons to these games are less germane, but like these games, I think that Fighting Formations has excellent potential for expansion and development. I try not to throw around descriptors like "must-have" or "new benchmark" lightly, but this game, in my opinion, represents a must-have new benchmark in platoon level wargaming. (see what I did there? ) If you like Second World War tactical wargaming at the platoon level, you should buy this game at your earliest opportunity. The game is so well designed and plays so well that it's hard for me to avoid hyperbole. The faults I find are so minor that it seems mean-spirited to even mention them. Granted, this is after a few solo plays and two face-to-face plays, and I've yet to try the larger scenarios, but even if this game fell apart completely in larger scenarios (though I don't think it would) it would still represent a major step forward in design at this level. Initial impression: amazing. My only significant criticism is the box art makes this game look like much less than what I believe it to be, that is, a game-changer (excuse the pun). You're obviously guilty of having a game crush, "Comrade"! Yes, I'm gushing at this point, so take everything I'm saying with a grain of salt. Play a friend's copy, watch a demo game, read along with the session reports, whatever it takes but you owe it to yourself to see how this puppy works. Reading the rulebook doesn't do it justice. You have to push that initiative pawn around to understand what deliciously agonizing decisions are involved. Stepping back a moment, one could argue that the hit and rally system is partially lifted from Conflict of Heroes, the combat system is also similar (to a point) and the reaction and op fire mechanics are just variants on what has been done in countless other wargames for ages. The command radius system is similar to that used by PanzerBlitz: Hill of Death – The Battle for Hill 112, Normandy 1944, though the execution is quite different. The order matrix might have been inspired by any number of Euros as well. It is really all that innovative a game? Taken separately, maybe not, but what wargame is completely novel on every level? The only one I can think of off the top of my head, Fields of Fire, suffers for its unfamiliarity and the fidelity of its gameplay to company-level command decisions and was received poorly by some as a result. Chad has wrestled a number of apparently disparate mechanics into a gestalt, sanded the rough edges smooth, and written another brilliant rulebook to explain how it all meshes together. This game is wargaming at its best, and promises to be the starting point for a great new line of modules and expansions. Well done, Chad Jensen and team. This is a gem of a game that I anticipate playing again and again in the years to come, thanks to your obvious devotion and love of good design. Thanks for the comprehensive review, Christopher. I'm glad you're enjoying the game! And your feedback is very much appreciated, nits and all. Playing time varies from about 90-120 minutes for the smaller one-map and half-map scenarios to probably 300+ minutes for the larger, two-map monsters. This is probably on the short side for most players. I'd say the short scenarios require at least 2 hours, and the largest one -- scenario #2, with about 100 units -- will need a long weekend to finish. During testing we found most of the scenarios fall within the 4-6 hour range. Our play times were 3 hours for shorter scenarios and 5 to 7 for the medium. Haven't yet played the double mapper or the longer looking scenarios. By far, this is my favorite wargame. Period. 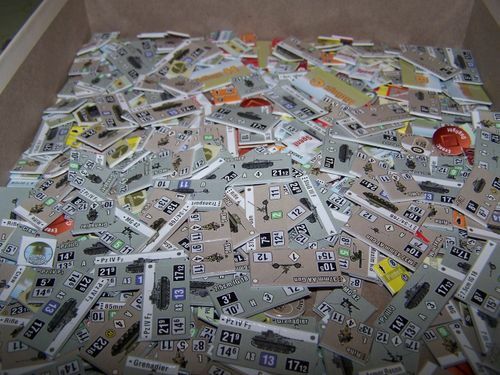 Perhaps it's time to unload my unpunched copy of PanzerBlitz: Hill of Death – The Battle for Hill 112, Normandy 1944 with PanzerBlitz: Carentan while I still can. Noted. I've edited the playing time to be consistent with your estimates. Perhaps it's time to unload my unpunched copy of Panzerblitz: Hill of Death with PanzerBlitz: Carentan while I still can. Great review. That guy holding the box sure is a handsome devil. So, what IS the deal with the cardboard APC, then? An art project my son brought home that day and he placed it down there just before I started taking pictures. I figured it belonged. Perhaps it will become our replacement for the fate card. That's the review I was hoping to write. Nicely done. Great review. Despite Chad's awesome rulebooks, I find that I still get rules wrong. I was using the old CC rule for hindrances, in which you reduced the attacker's FP value by the hindrance. I see now that it works like ROF. Thanks again. Hoping to get this to the table again soon. My grog partner enjoyed the game, but was not overly impressed . . . he main complaint (and he didn't have many of them, other than that he prefers more familiar mechanics) was that he felt artillery barrages should have a weaker effect outside of the "ground zero" hex. I explained that the decision was probably a design choice to keep an already medium-complexity game within that medium-complexity level, but on another level, I agree with him. In any case, there's few nits to pick in this game by one of my favorite designers. Great review, but I have to disagree with your judgement of Tank Leader. I don't think it was clunky at all, and took a few seconds to decide whether to trump. I haven't played FF yet, but I'm guessing the decisions are more time consuming. Fun review! Your enthusiasm is contagious. This game is getting such positive reactions. I hope it becomes available from some Polish sources soon. if you're a die-hard wargamer that points and howls like Donald Sutherland's character at the conclusion of "Invasion of the Body Snatchers" when you see Euros, get over it. Could someone please elaborate on the 'Designed for two players but quite playable solo'? Thanks. and various comments about solo in many other threads. Generally it seems to me that people who like playing both sides in other 2-player wargames enjoy this one solo too. 1) Really becoming to hate the Squad/Platoon markings! The more I play this, the more it's irritating that it's not more intuitive. TOO small, too easily missed, and NOT at all visually friendly when looking over the mapboard. 2) Believe that topdown art would have been the correct choice. Why when you're looking at the battlefield from the top, you're viewing all the elements on their sides. To me this would have been nit-picky years ago, but with the state-of-the-art graphics now do-able I believe that we should have the best look possible for the game. This to me was reverse thinking! 3) From years of flipping counters I also find fault with the flipping from top to bottom of the square counters. It's just not intuitive (or at least not when learned for years of play the other way), EVEN if the vote of the playtesters decided it. 4) I'll have to agree that the colors could have been better differenciated for the opponents. In many of the pictures here on the geek you can see that they could be easily confused in poor lighting, though I've not had much trouble with this one as my gameroom's lit quite well. 5) Yes, the cover art, and back writeup are uninspiring. Though the writeup is pretty typical of the wargame genre, if it was just with a group of games on the shelf; if I didn't/hadn't played Combat Commander and knew Chad Jensen's name; if I hadn't somewhat anticipated the release from GMT, if;if;if... I'd probably never given it a second glance and would have missed a probable future classic. Nuff said... And if there IS a reprint with these changes (1-3 being the crux) I'll happily plunk down another $50-70 and get another copy for continuance and future uniform continuation of the series. Long may Chad's star shine, I believe that we're looking at another future classic here. Move! Advance! Fire! Rout! Recover! Artillery Denied! Artillery Request! Command Confusion...say what?! he main complaint (and he didn't have many of them, other than that he prefers more familiar mechanics) was that he felt artillery barrages should have a weaker effect outside of the "ground zero" hex. I explained that the decision was probably a design choice to keep an already medium-complexity game within that medium-complexity level, but on another level, I agree with him. That's why they're called "barrages" and not "surgical strikes." I'd pay for reprint run for countersheets only with better squad/platoon markings and especially for better color contrast (I've understood that counter color contrast was misunderstanding in print). Top notch review! Well done. Chad should get you to do the back side write up of his next FF game. 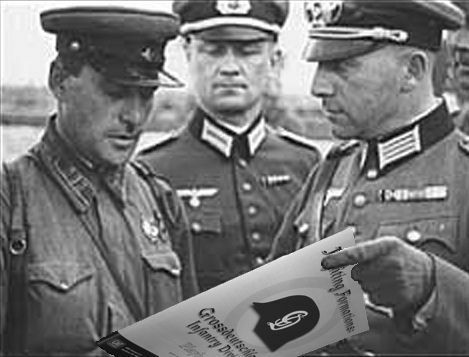 I just saw (but haven't read; I’m still at work) your Fighting Formations review on the front page. FF is my first real foray into true wargaming (other than Memoir 44, which doesn't count, Richthofen's War which I played as a 'kid'.) I'd been intrigued by Combat Commander: Europe but have shied away from picking it up as the card mechanism of Memoir44 never clicked with me and have been afraid it was simply a complex version of the same system. (If you've played both, is this a valid concern?) Later I picked up Dominant Species. It was a hit with myself and my son James (though less so with some of the less confrontational members of my home game group). Surfing outward from Dominant Species led me to Fighting Formations. What I read intrigued me. FF seemed to meld some Euro-friendly concepts with the Order Matrix and Initiative Track systems; these intrigued me more than the card system of Memori44, where the left center right flank card system felt overly simplified and limiting. The 50% discount code from GMT for 'liking' them on Facebook was the bait I needed to take the plunge and put in the order for Fighting Formations. Generally things went well, rules-wise; there's a lot to manage there, but everything flowed together quite well. About halfway through we did realize one error - (we were forgetting to pay initiative costs for OP/return fire). I was surprised with how chit-fiddly it was, even compared to some of Splotter's biggies; with all the activating/deactivating between actions there's more chit flipping than a game of R&B or Antiquity. My lingering concern is that the limited frequency of play combined with the rules depth will make for continual learning games and rules errors. We will just have to get more games under our belt quickly to ingrain the rules into long term memory. Luckily the system seems relatively straightforward to facilitate that process. Kudos, Jeff, to you and your son for giving it a go! I'd say it's a testament to the game that with no "real" wargame experience you were able to pick it up easily. I'm sure it's a testament to your gaming aptitude as well! The decay of Mission to Tactical command models a sort of order delay in responding to local threats and tactical successes or failures, something which requires an entire subset of rules in the Tactical Combat Series (TCS) - albeit the FF:GD system does not cover that aspect in quite as much depth. Actually, the core of the TCS system is the need to explicitly plan ahead and then stick to the plan you marked down - I don't see that in here at all. avoids getting bogged down in card trumping decisions as in the Tank Leader system. Yes, I'm gushing at this point, so take everything I'm saying with a grain of salt. I commend you for saying that. Play a friend's copy, watch a demo game, read along with the session reports, whatever it takes but you owe it to yourself to see how this puppy works. Reading the rulebook doesn't do it justice. You have to push that initiative pawn around to understand what deliciously agonizing decisions are involved. So, if you have agonizing decisions in FF that's delicious, but in other games (such as Tank Leader) it's annoying. I think I see what the common factor is - a desire to beat up the old to make the new look shinier. Not that the new can't be better (that's what we always hope for, don't we), but these specific arguments you bring seem to contradict my experience with the other games you mentioned and that makes me wary. Mind you, it does look like an interesting system, and I plan to play it, but this review doesn't really help me make up my mind. Yeah, can't have fidelity, can't we... that just has me shaking my head. Markus has some very valid criticisms of my review, especially with regard to Tank Leader, so I will take some time to mount a defence later today at lunch. I will edit this entry, so this is just me "reserving" a spot here. I will say briefly that I am an ardent fan of Fields of Fire, and my comment that it suffers for its fidelity was in relation to its reception by the gaming community, not because I dislike the game because of its fidelity. I will respond more in depth to that point as well. I will also explain what I mean about TCS in relation to order decay, and how it addresses the very point that you bring up about the ordering system. Thank you for your criticisms. I will take the time to address them in a few hours. I was referring to the delay required by changing plans in TCS; based on my understanding of the system, you write up Op Sheets, which then requires you to calculate Command Prep, and then the Op Sheets accrue weighted turns representing the value of time spent preparing. This is an interesting, if involved, method and perhaps most faithful to the actual execution of order giving in "the real world", since, as you point out, it requires you to explicitly plan ahead and then stick to the plan you marked down. The requirement in FF to place a command marker at a specific location, representing local leadership and planning efforts, "evokes" this necessity without tying the player to a very specific planning sheet. As the order "decays" from Mission Command to Tactical Command (requiring greater expenditure of initiative to activate units), the modelled factors are the difficulty in adjusting to outside effects on the plan, with the attendant reduction in efficiency and speed of orders. This plays out in how the initiative track is adjusted. The command marker can only leave the map via "decay" (orders aging and becoming invalid in face of the current tactical situation), elimination by enemy occupying a hex containing a command marker (the capture or complete disruption of command elements), or by the "sniper" action, which as noted in the rules, is not so much a man with a scoped rifle going for headshots on guys with shiny epaulettes, but the various breakdowns in communications (cut lines, lost runners, jammed radios) which have the effect of reducing command efficiency. So, to clarify, I agree that the TCS system is more "simulative", but it also requires a fair amount of paper bookkeeping and a generous helping of order interpretation self-policing. The FF system evokes some of the same frictions (how does one's precious plan survive contact with the enemy? ), losing some granularity, while preserving some of the flavour and much more of the immediacy of command decision requirements, without needing written orders or a fair-minded opponent. I misspoke here. I will expand on my experience with Tank Leader. 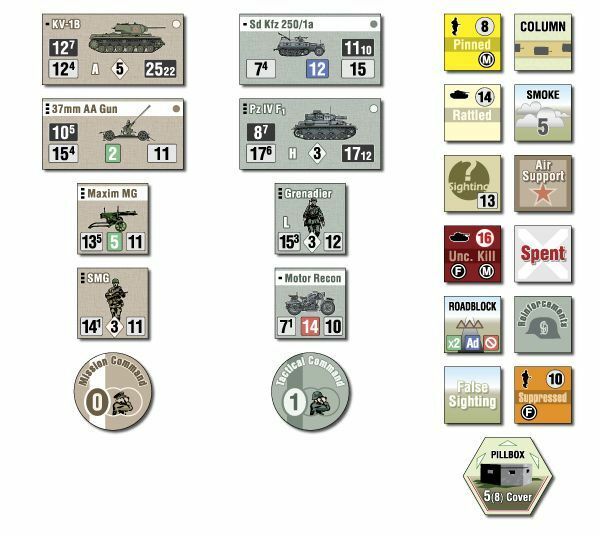 I played three games of Tank Leader and though I thought the C3i system was an intriguing effort, I found myself feeling at odds with the stacking and re-ordering of cards over the course of the turn. The interaction of the cards seemed to require more effort than the resultant evocation of command control issues, and although the trumping decision itself is easy, the card ordering system as a whole felt like it slowed gameplay beyond what was necessary to evoke those details of command. Since I played it two years ago, my memory of the details of it may be hazy, but my impression coming away from the game was that the card C3i system seemed to hinder, rather than enhance, the gaming experience. To me, it slowed gameplay. As more formations were added, this effect became more pronounced. This was only my opinion, of course, but it was generally shared by my opponent at the time. Groupthink? Incorrect rules interpretation? Possibly. I shouldn't want anyone to think that I think Tank Leader is garbage; far from it, I think the system was also an important step towards making some effort to recognize why relatively smaller numbers of men with somewhat superior equipment were able to make such dramatic progress against a numerically superior and occasionally equipment-equal foe. I felt after playing Tank Leader that I was clashing with the command system, even though I wanted it to work - I sought out Tank Leader (not super-easy to find in the Toronto area) specifically for its fabled C3i cards. When I find that kind of "boggy"-feeling occurring, even when I want to like a game, I want to comment on it. You're putting words in my mouth. No where did I say I felt those decisions "annoying" - I said "clunky" once and "bogged down" once. Just because something slows me down doesn't automatically mean it annoys me. Comparatively, I thought the flow of gameplay was better in FF:GD after three or four plays, in relation to TL. I have no desire to "beat up" any system in this instance. If I did, I would have used much harsher words. The harshest words I used were "get over it" in relation to wargamers who can't stand what they perceive as "Euro-style" mechanics (or pieces, or what have you), and those words I stand by. As mentioned above, I love Fields of Fire. I use its microbadge below my avatar. The way that it models order planning and company-level decision making isn't a straight simulation per se, but the requirements to pay attention to things like field telephone lines, casualty evacuation, supply and a myriad of other things, coupled with a altogether different "mapping" system AND what is sometimes a poorly organized rulebook, made it hard for people to grasp. I loved it. I also had trouble grasping it at first, but I played through. Because Ben Hull took so much time to model the "company commander experience" faithfully, it complicated an already unfamiliar system. That's why it suffered with the gaming community, despite it being, in my opinion, one of the best and most innovative systems to come out in wargaming (at that squad level) in the last five years or so. Once again, thank you for your criticism, and I hope that my answers clarify what I think were poorly phrased notes on otherwise respectable games. Well, colour me a skeptic. It may be 'simple and effective'. It may be different from Tank Leader (which I don't ever recall being 'clunky', but that's by-the-by). It's the word 'modelling' that worries me. What does this model? How does this map to history? Or is it just a neato gameplay feature that you like a lot and are trying to sell us as being historical? Could you give some examples of how the initiative/order system maps to history?